Thunderstorms early, overcast overnight with occasional rain. Gusty winds and small hail are possible. Low 44F. SSW winds shifting to N at 10 to 15 mph. Chance of rain 100%..
Thunderstorms early, overcast overnight with occasional rain. Gusty winds and small hail are possible. Low 44F. SSW winds shifting to N at 10 to 15 mph. Chance of rain 100%. Ted H. Wanta, 82, passed away peacefully Friday, Jan. 25, 2019. He was born June 28, 1936, to Minnie and Leo Wanta, in Stevens Point. Ted served in the U.S. Army Reserves. 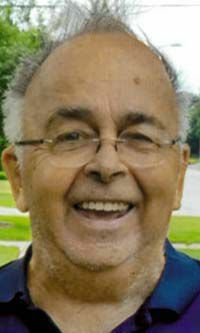 After serving, he traveled around Wisconsin and met his wife Joan, and they married in Beaver Dam on Sept. 28, 1963. They eventually moved to Milwaukee, and then settled in West Bend where they lived for more than 50 years. He worked for Badger Packaging for more than 30 years, finally retiring to pursue his great love of fishing, hunting, golfing, bowling, volleyball and being a casino card dealer. He is survived by his wife, Joan “Joanie;” children, Debra (Peter) Oberg, Linda Starr, Sue (Jay) Sciachitano; grandchildren, Megan Starr, Luke Oberg, Bella Sciachitano; a brother, Ronald Wanta of Los Angeles, California. Further survived by aunts, uncles, cousins, nieces, nephews and friends. He was preceded in death by his parents; sister, Lucy; brothers, Leo and Donald Wanta; as well as other friends and loved ones. There will be an interment at 1 p.m. on Saturday, Feb. 9, at St. Peter Cemetery, N6791 County Road G, Beaver Dam. Following the interment, the family will host a reception at Walker’s Restaurant, 813 Park Ave., Beaver Dam. Phillip Funeral Home of West Bend is assisting the family. Visit phillipfuneralhome.com.